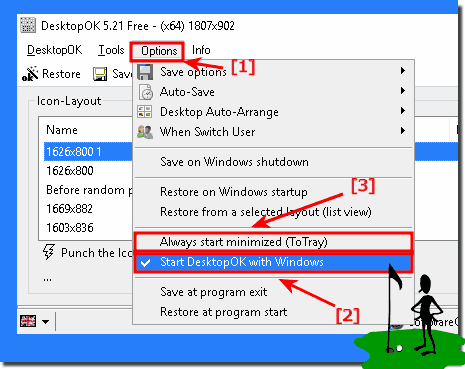 It is easy to start the Freeware Desktop Icon Restore for Windows minimized and /or always minimized To-Tray in Windows Desktop-Tray Bar. DesktopOK minimized in the Tray-Area example, and it does not matter whether it is Windows 10 or Windows 8.1/7 or Microsofts Serve 2016 / 2012 / 2008! 1.) ... Start in To tray via command-line! 2.) ... Start in To tray via at Windows Startup! Please use ... the latest version of DesktopOK! See also: ► ... Minimize Thunderbird in tray example! 1.) Start in To tray via command-line! (Image-1) Command line to start the program minimized in Tray! 2.) Start in To tray via at Windows Startup! it is also very easy to start this desktop save software minimized in tray at windows start. ► Difference between Shut-Down Save and Auto Shut-Down Save! 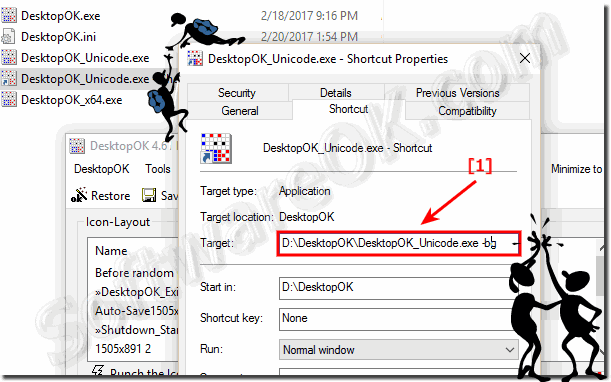 Enable the option to Minimize any window on the Windows desktop to the To-Tray area of ​​the Windows taskbar. Because not every program has a to-tray function and if it takes longer, for example, you can move it to the to-tray area. So you do not close it by accident. Here's an example: ... Minimize Thunderbird info or tray area! (Image-2) Start the program minimized at ms windows start and always! DesktopOK - FAQ-2: Is there a command line option to start the program minimized? Thank you for DesktopOK. Is there a command line option to start the program minimized? rather than displaying in a normal window and then manually minimizing?